Audio: “Kekionga” featuring Tom Castaldi. Courtesy of 89.1 WBOI. In what is now Lakeside neighborhood, there used to be a settlement of Native Americans, a gathering of an array of villages. This settlement was known as Kekionga, which was a center for the Miami nation. The Miami were first discovered in 1654, living in and around the Green Bay, Wisconsin area. They were discovered by the Europeans who were exploring North America at the time. At the time of their discovery, the Miami were far from their native land, which was around the lower Great Lakes. Many of the Miami tribes were being pushed out of their homelands by the Iroquois, who were armed and backed by the Dutch and English, who believed the Miami and other western Indians had befriended their French rivals. The Miami had six clans and numerous groups, but did not have a chief or king. However, they did have chiefs of certain villages, especially those that held several bands. 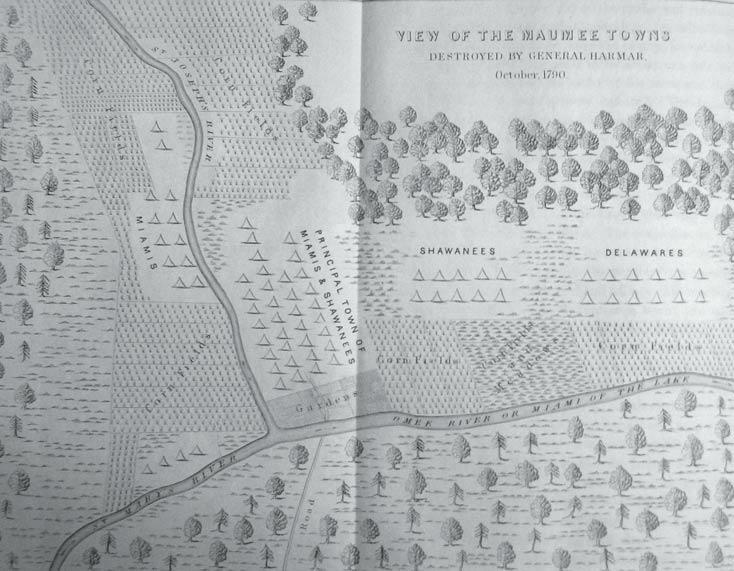 At the time of the Miami grouping in 1790, Kekionga was also the gathering place for the Huron, the Ottawa, and the Shawnee. Kekionga, “the center of Indiana resistance” was surrounded by corn fields and was located on the grounds near the Maumee and St. Joseph rivers. Many had envied the land, which these settlements had occupied. Within the land were rich gardens, cattle, and dome shaped residences called wiccias. According to tradition, Kekionga had the meaning of a sacred and ancient place to the Miami people. In the spring time, the scattered families from all the bands, would leave their winter grounds and come to Kekionga. Here, they would prepare their fields and ready themselves for war. Kekionga was looked at by eastern Americans as a place of Indian resistance, to the continuing expanding of the United States frontier. This village was a very feasible economic center, because of the successful fur trade along the rivers. Kekionga remained a successful, economically and culturally, Native American dwelling until all Native Americans were forcefully removed from all of Indiana in 1846. 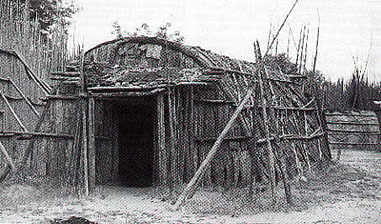 Traditional log homes, were common dwellings known as wiccias. A map of the region Kekionga inhabited. “Military Journal of Major Ebeneezer Denny: an officer in the Revolutionary and Indian Wars“, written by: J. B. Lippincott & Co., for the Historical Society of Pennsylvania, (1859).